In my last post, I provided a WPF MVVM multi-project template comprised entirely of F# projects. While that approach is exciting, I found that having the Views in an F# project caused more pain than gain. As an advocate for using the right tool for the job, I have created a new WPF MVVM multi-project template composed of an C# View project, an F# ViewModel project, and an F# Model project. Additionally, this version includes an F# Repository project and an F# project called FSharpIoC that provides inversion of control functionality (this can easily be replaced with the IoC contrainer of your choice). The F# code did not change significantly between this version and the last; however, the ExpenseItHomeViewModel.fs has been cleaned up due to refactoring and the introduction of the ExpenseReportRepository. You can find the template installer here and the full source at http://github.com/dmohl/PolyglotWpfMvvmTemplate. I've been planning for a while to create an F# WPF MVVM Template to add to the other templates that have been announced on this blog. A resent post by Mark Pearl provided a great simple example which helped kick me into gear and bring this plan to fruition. This particular template is slightly different than the others. While the others had most or all of the code written in F#, the views or endpoints were still provided via a C# project. In contrast, this F# WPF MVVM template contains only F# projects. The view models are fairly standard. Each view model inherits from a ViewModelBase class. 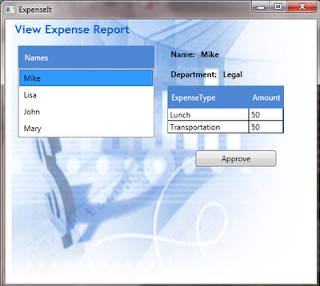 The ExpenseItHomeViewModel class contains most of the code. Since these are the two most interesting classes associated with view models, they will be the only two shown. You can download the template installer here and find the full source at http://github.com/dmohl/FSharpWpfMvvmTemplate. I did run into a few limitations with having the views in an F# project. Because of these limitations, I would likely use a polyglot approach with a C# project as the view container and F# projects for the model and view model containers for solutions that are any more complex than this example. I plan to provide a template for the polyglot approach in my next blog post. While I really liked Son of Obsidian, there were a few settings that made my eyes hurt. After tweaking font colors specific to Resharper, Visual Studio 2010 Productivity Power Tools, etc., I can now say that this is officially my favorite theme. 1. Download Son of a Son of Obsidian here. 3. Select "Tools" then "Import and Export Settings..." from the main menu. 4. 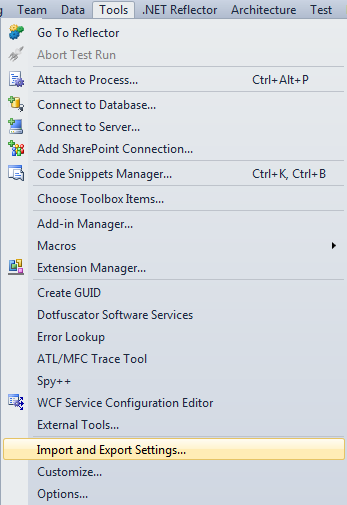 In the resulting wizard, select "Import selected environment settings" and click "Next". 5. Select "No, just import new settings, overwriting my current settings" and click "Next". 6. Click the browse button, locate the file that you downloaded in step 1, and select it. Then click "Next". 8. Finally, assuming the import is successful, click "Close". In the interest of building up a larger set of installed templates for F#, I've ported the standard C# WCF Service Application to F# and packaged it into a .vsi file. You can download the installer from here and get the full source from http://github.com/dmohl/FSharpWcfServiceApplicationExample. In one of my last posts I showed a simple web application (created with the help of WebSharper Platform 2010) that captured registration information from a user and saved it to a CouchDB database. I've been using CouchDB for a while now and I'm still amazed at how quickly you can get things up and running when you don't have to worry about the object-relational impedance mismatch. To interact with CouchDB, I primarily use Relax (a full featured ".NET API abstraction of CouchDB's (excellent) RESTful API"); however, I thought it might be fun and educational to create a simple CouchDB .NET API abstraction in F#. Note: The code provided here is loosely based on SharpCouch. Without any further ado, here's the code. ProcessRequest (BuildUrl server database) "PUT" "" ""
ProcessRequest (BuildUrl server database) "DELETE" "" ""
|> ProcessRequest (BuildUrl server database) "POST" "application/json"
ProcessRequest ((BuildUrl server database) + "/" + documentId) "GET" "" ""
let jsonObject = ProcessRequest ((BuildUrl server database) + "/_all_docs") "GET" "" ""
ProcessRequest ((BuildUrl server database) + "/" + documentId + "?rev=" + revision) "DELETE" "" ""
F# + CouchDB = totally awesome! You can find the full solution with integration tests at http://github.com/dmohl/FSharpCouch. F# makes it very easy to develop high performance, readable, and efficient code. However, like all things, a lack of discipline and best practice adoption can lead to a mess. In this talk we will cover 5 best practices that you can start using today to make yourself a better F# developer. We will explore each best practice, discuss the reason(s) that the described approach is preferred, and explore a few examples. For more information visit www.fsug.org.